As healthcare becomes more efficient and sometimes less invasive, treatment doesn’t necessarily require a hospital or doctor’s office. That also means that the critically ill or immobile patients don’t have to go through the burdensome process of leaving their home. If you’re looking into home health care and you’re on Medicare, you might be wondering if Medicare covers home health care treatment. The answer is, yes. Home health care services are covered under Original Medicare—Part A and Part B. As long as you qualify you should have no out of pocket costs. Before Medicare covers your home health care treatment you have to be deemed eligible. Do you meet these criteria? You’re under the care of a doctor and that plan is reviewed regularly by the doctor. You and your doctor agree that you need skilled nursing care, physical therapy, speech or language services, or continued occupational therapy. The home health care agency is Medicare-approved. Your unable to leave your home without major effort or your doctor recommends that you not leave your home. Your doctor, or an eligible representative of your doctor like a nurse practitioner, must have face-to-face encounters with you at certain intervals to address the reason you need home health care. Finally, home health care is normally “intermittent”— less than 7 days per week for less than 8 hours each day and 28 hours per week for up to 21 days. If you need full-time skilled nursing care, you won’t usually qualify. Skilled Nursing- A registered nurse (RN) or licensed practical nurse (LPN) may provide services like giving IV drugs, injections, feeding tube maintenance, teaching about diabetes care, and more. Other Therapies- Therapies like physical, occupational, and speech-language pathology are covered if they’re considered “reasonable and necessary.” Treatments must be specific, safe, and effective for your condition and too complex to administer on your own or by somebody without specific skills. The therapy must improve functions affected by your illness or injury or a skilled therapist must provide services that prevent your condition from getting worse. Home Health Aide- Medicare pays for somebody to administer personal care if you’re also receiving one of the services above. Medical Social Services- You may receive treatment for social and emotional concerns if your doctors believe addressing those will help you recover quicker or may interfere with your treatment. Medical Supplies- Wound dressings or other similar supplies as ordered by your doctor. Medicare pays for other medical equipment outside of home health care. Medicare will not pay for meals delivered to your home, services like shopping, laundry, and cleaning, and custodial or personal care—bathing, dressing, or using the bathroom. Before any treatment begins the Medicare-approved home health agency should tell you and put into writing a breakdown of the charges Medicare will pay and how much you will pay out of pocket. 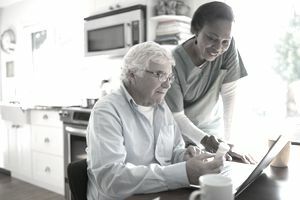 For any services that the agency wants to provide that isn’t covered, Medicare requires you to receive an Advance Beneficiary Notice of Noncoverage (ABN) that states the treatment that Medicare won’t cover and clear directions for getting an official decision from Medicare and how to file an appeal if Medicare won’t pay. They must also give you an ABN if your doctor changes the orders or will not renew. Keep in mind that your doctor may recommend certain home healthcare services that aren’t covered by Medicare. As you talk to your doctor ask plenty of questions including why they are recommending services that won’t be covered. Next, talk to Medicare to verify coverage and see if you can appeal. Although most home health care agencies are honest, there are plenty of instances of Medicare fraud. The best way to protect your home health care benefit is to carefully review your bills and know the care you’re entitled to receive. As you review your bill look for services and equipment you never received, fake signatures, services ordered by a doctor that you’ve never met, and home health care agencies that offer you freebies in exchange for your Medicare number. Any of these are potential red flags and should be reported to Medicare right away.